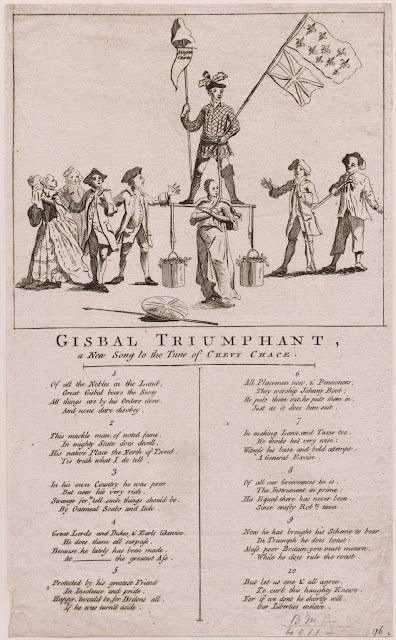 "Gisbal Triumphant: a New Song to the Tune of Chevy Grace," artist unknown, 1763, Lewis Walpole Library. Atop the lyrics for "Gisbal Triumphant" is a political cartoon bearing every symbol a diehard Tory of the eighteenth century would dread. A Jacobite stands atop the yoke that anchors Britannia. He holds the rope to her bound wrists, while bearing a staff topped with a phyrgian cap and a banner proclaiming the "Magna Charta." In his opposite hand he holds a flapole with French colors flying over the British, a symbol of surrender and defeat. In the pails that weigh down Britannia's yoke sloshes cider, a reference to the cider tax imposed to pay for the Seven Years war. Among the onlookers are shocked gentlemen, sobbing women, and one sailor. His hat is irregular and difficult to define. It may be a ragged round hat, or a cocked hat that has been crumpled through use. One may even interpret it as a poorly engraved attempt at hair. 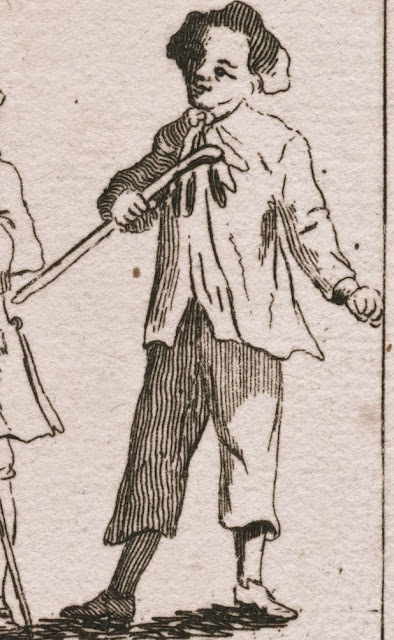 He wears a plain neckcloth bound close to the neck, and a smock without cuffs, buttons, collar, or pockets.Plain trousers run down to the top of his calf and are somewhat loose, but not so loose as petticoat trousers. His stockings are also plain and apparently white, ending at relatively pointed toe shoes. In his right hand is the ever present friend of the sailor ashore: his walking stick.